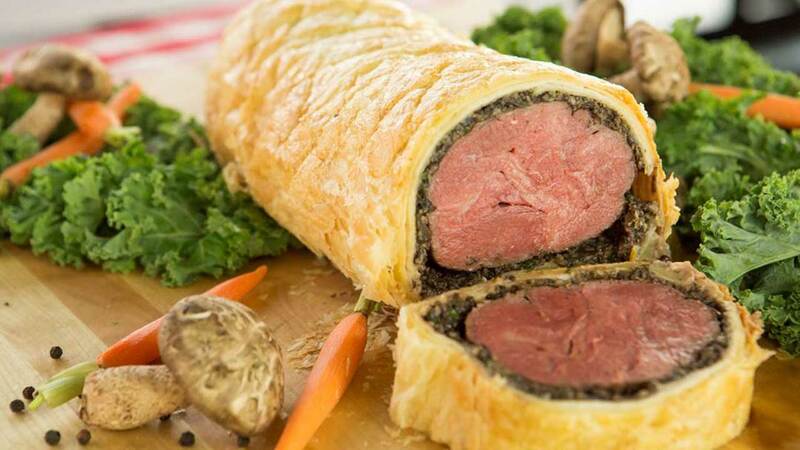 HOUSTON (KTRK) -- Wow your sweetheart this Valentine's Day with this easy, classic, beef wellington recipe courtesy of B&B Butchers. For the Mushroom Duxelles: Finely chop mushrooms, shallots, garlic, and thyme and add panko breadcrumbs. Add butter or olive oil to a large saute pan and set over medium heat. Add the shallot and mushroom mixture and saute for about 10 minutes until most of the liquid has evaporated. Season with salt and pepper and set aside to cool. To prepare the beef: Tie the tenderloin in 4 places so it holds its cylindrical shape while cooking. Drizzle with olive oil, then season with salt and pepper and sear all over, including the ends, in a hot, heavy-based skillet lightly coated with olive oil - about 2 to 3 minutes. Let cool. Set the Filet on the puff pastry, top with foie gras and mushroom duxelle. Wrap puff pastry around the tenderloin and seal with water or egg wash.